The best way to explore Montenegro is by bike & hotel. On this tour, which can be perfectly combined with our boat & bike trips from Dubrovnik, we discover some particularly picturesque towns as well as the fantastic coast of Montenegro. Departure point of this journey is Dubrovnik in Croatia, one of the most beautiful cities in the Adriatic and a World Heritage site. Because of its historical importance it is often called the “Athens of Croatia”. 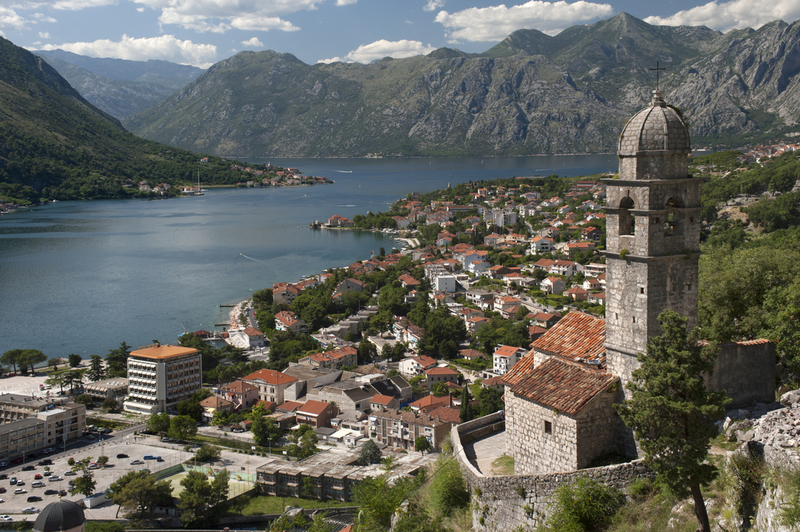 Montenegro, one of the youngest states in the world, is our main destination. Together with our guides we discover the bay of Kotor whose steep limestone cliffs make it one of the most impressive landscapes in the entire Adriatic. Also visited is the coastal city of Budva as well as Montenegro’s former capital Cetinje. On all ships we also offer the Swiss high quality FLYER E-bikes. Electric bikes are a true declaration of independence for everybody who enjoys physical activity. They allow hassle-free cycling as well as climbing mountains without difficulty. But all daily cycling routes are planned in a way that also suites our regular hybrid trekking bikes. Individual arrival either by car or by plane to Dubrovnik Airport. Take a short taxi ride to nearby Cavtat and check-in in the first hotel. Afterwards we have the opportunity to stroll around the laid back little city or visit nearby Dubrovnik. Here we also have the possibility to join a guided tour through the city in the evening, before we return to the hotel in Cavtat. From Cavtat we cycle through the region of Konvale to the border of Montenegro. Our way presents us with plenty of spectacular views above the deep azure sea and the fertile vegetation. After passing the border the terrace-like bay of Kotor opens up. Along the coastal road we continue biking to Herceg Novi, which lies in the entrance to Kotor Bay. Use the opportunity to have a swim on the promenade of Herceg Novi. Later on we check-in in our hotel and are offered a guided tour through Herceg Novi. Overnight stay in Herceg Novi. In the morning we cycle along the coastal road of Kotor, until we reach the ferry from Kamenari to Leptane. From there our cycle tour takes us first to Tivat and then on a nearly traffic-free panoramic road with spectacular views as far as Budva. In the afternoon we have enough time to explore the lively and picturesque old town of Budva on one’s own or we can cycle a bit further in order to visit the famous hotel island of Sveti Stefan. Before dinner we can join a guided city tour through Budva that has a very changeful history and was destroyed almost completely by an earthquake in 1979. We spend the night in Budva. After a short transfer ride we reach the former Montenegrin capital of Cetinje. From here we take a beautiful cycle ride to Virpazar. By the side of the famous Skutari Lake, which is 48 km long and 14 km wide and therefore one of the biggest lakes of the Balkan peninsula. For the migratory birds on their journey to the south it offers a welcome resting place. In 1983 it was declared as a national park. Overnight stay in Virpazar. After breakfast we jump back on our bikes and cycle on an almost traffic-free road as far as Rijeka Crnojevica. The place is known for its architecture and typical stone houses of the 17th and 18th century. Then we are free to decide to return to Cetinje by support vehicle or discover the last 20 km/12 mi. and 700 m of elevation/2296 ft by bike. On the city tour in Cetinje we explore the most important sights, for example the Montenegrin president’s residence. In addition a lot of other government buildings and former embassies testify Cetinjes past as the capital city. Overnight stay in Cetinje. A transfer bus brings us after breakfast up to Lov?en. Depending on our mood we have the opportunity to leave the shuttle earlier in order to cycle a part of the increase on one’s own. From the highest point (more than 1,500 m above sea level) we can expect a rapid descent with spectacular view of the Bay of Kotor which is surrounded by mountains reaching heights of up to 1,700 m. It is the largest and best-protected bay in the entire Adriatic. Today’s cycle tour leads us to Kotor. The town is almost 2,000 years old and famous for its medieval centre listed as a UNESCO World Heritage site. Here a guided city tour is included and we may end the day with a leisurely walk through town and drink at one of the numerous cozy cafès and bars. We spend the night in Kotor. The last cycle tour leads us along the bay of Kotor until we reach the ferry in Kamenari. We cross the impressive bay of Kotor for the last time and board the shuttle bus on the other side. We will be taxied back to Croatia, where we make a stopover in one of the most beautiful restaurants of the country. Only a few more kilometres by bike until the end of the cycle journey. Individual trip home or extended stay in Dubrovnik. This bike tour requires a good basic fitness, which you should have acquired through regular bicycling. The day trips climb between 200 and 500 m. The day trips of 30-50 km on average traverse some hilly and mountainous terrain. Some steeper and longer ascents must also be tackled, but it is perfectly acceptable to push the bike if necessary. Most of the roads are asphalt and not used much outside the holiday season. A support vehicle accompanies most of the daily tours.